I’m confused – is this a supercover set in the world of Judge Dredd? Because that would be a change. Or maybe it’s a different Mega City? Anyhow I’ve got no clue who the artist is this time around. The buildings look a little Ian Gibson-y, but I wouldn’t swear to it. It seems that Bill Savage has already given up on visiting actual locations in his cross-country journey, and this week he drops by ‘Novatown’, the brand new city built in the North East. It seems that in the first days of the war the Volgans dropped nerve gas cannisters on the city, killing every single person. Then, for some reason, they proceeded to cart all the corpses away, leaving the city utterly empty. Which is the state it’s in when Silk and Savage arrive, looking for cover after attacking a Volgan border camp. Searching the streets they spot a living man behind the desk of a luxury hotel! He proves to be the sole survivor of the attack, because he was the only person in the entire city who owned a gas mask. He offers his hospitality to the two Mad Dogs, who greatfully accept the opportunity to take a hot bath for the first time in months. They don’t reciprocate the favor by warning the crazed old coot that a Volg patrol is out searching for them. As a result, the man gets brutally stabbed by Volgan bayonets. Although Bill is caught off guard, he reinacts a scene from The Good, The Bad, and The Ugly to pull his fat from the fire, while looking unusually deranged. The immediate Volgans delt with, Silk and Savage still have the rest of the patrol left to kill. Luckily the nearly-dead survivor has a tip to offer – there’s an unexploded cannister of nerve gas left in the city! The Mad Dogs scrounge up some gas masks and detonate the WMD, killing all the nearby Volgs. Not exactly even revenge for the death of an entire city, but it least it’s an emotional victory. It’s less of a victory for the reader, however, seeing Invasion go back to its standard storyline of ‘Savage meets themed character, themed character sacrifices himself to kill some Volgans. I’ve accepted at this point that there’s never going to be an overarching plot to Invasion, but mixing it up a little would be nice. The final match of the Aeroball world series is about to start, and I couldn’t care less. The Heroes are going to be facing off against the Teutonic Titans, who dress as knights and, preposterously, carry shields. Far more importantly, the Heroes have finally gotten around to discussing the fact that Cord publicly revealed his complicity in the attempts on their lives. Of course, they don’t have any proof, and Cord is rich, so their options are limited. Louis announces that he’s got a floating-brain scheme to deal with the situation, but he doesn’t announce what it is. Days later the Heroes return to their home base to discover that all of their equipment has been stolen. Naturally Cord rushes in to offer them a new set of jetpacks and armor, ones that he’s sabotaged to ensure that the Heroes are all killed in the big game. The readers are treated to his interior monologue announcing his evilness, so there’s no doubt, but he’s still vague as to his motives. Hopefully we’ll get those next issue, when the story wraps up. Okay, it might not wrap up next issue, I guess I’m just getting carried away with fantasy. 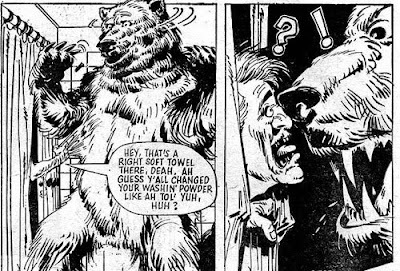 Continuing this strip’s bizarre structure of being about a bear, we stick with the yogi’s point of view as he attacks a small human settlement. First is a preposterous sequence where he attacks a cop in a snow buggy, whose calls for help are disregarded by the sheriff on the other end of the radio. Because when you’re living in the arctic, you’d naturally assume that a person screaming bloody murder about a bear attack was a joke. And, you guessed it, nobody believes Jake about the bear, either. He’s quickly dragged back to bed and sedated, giving Shako more time to wander over to the sheriff’s house, which leads to my new favorite panels in the history of this comic. It seems that the sheriff is taking a shower, and therefore can’t hear a 1-ton bear bursting through the front door, wandering around the house, and finally pushing his way into the bathroom. A bathroom that apparently has a 13-foot ceiling, as you’ll see in a moment. Yup. He thought the bear was a towel, which led to a hilarious double-take. The proceeding violence is decidedly less hilarious, or maybe just as, depending on one’s feelings about naked people being torn apart by polar bears. Finally Belle, the sheriff’s wife, hears the screams and runs into the bathroom – her excuse for not hearing the bear ransacking their house is left to our imaginations (I’m guessing it’s headphones like in Terminator, but with a hi-fi rather than a Walkman, which had yet to be invented), and Shako quickly kills and devours her as well. That’s a startling three deaths this week, none of whom died slowly. Which brings Shako’s total killed slowly statistic to 1 out of 16, or 6%. It’s a little bit of a challenge to review these stories, since they’re just simple setup and punchline affairs with no continuity and very few pretensions. I suppose unless I’m presented with any really fascinating images I’ll just tell you the setup and the twist, and leave it at that. 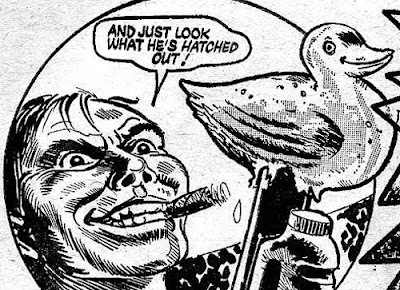 At least until we get to the ones Alan Moore wrote. Yup, it’s a human farm owned by ants, who live in a crude mockery of human society, bet you didn’t see that coming! A train has been taken hostage by the ‘Third World Terror Group’ and there’s only one man who can save the passengers… John Probe! He arrives on scene and gets a rundown of the situtation. It seems that the leader of the terrorists is one Felix Wraffen, a twisted killer who was recently paroled on medical grounds. This seems like a weirdly preposterous right-wing attack on the justice system, or it would, had it not actually happened just recently in England. The french authorities want Probe to attempt negotiations, but he defers… Action’s more his style! So he drives up alongside the train, shooting at the terrorists until one uses a grenade to blow up his armored car. That’s not stopping Probe, though – he simply tears a piece of burning metal from the wreck and shields himself behind it as he charges the train. At this point, you may be wondering why all the hostages aren’t dead. That’s an excellent question. The answer? The terrorists are absolutely terrible at their jobs. While Probe is busy setting the train on fire Felix wants to kill everybody in the rear car, but one of the other terrorists protests, claiming that, despite the fact that they’re actively being fired on by the authorities, he can still resume negotiations. Felix loves murder too much to bother trying, so he just shoots the other terrorist and heads back towards the hostages. Probe, who’s crawling under the train at the time, decides to protect the hostages in the only way he knows how. What’s that? No, he doesn’t just climb up to the doorway and punch Felix when the door is opened. Instead he shoves the back car really hard, tearing the couplings apart and sending it rolling uphill at 11MPH. Which seems like a gross exaggeration of his powers as we’ve come to know them. Hell, just two pages ago it took 80% of his hyperpower to tear a metal door off the wreck. And now he’s got no trouble sending a 50-ton locomotive up a hill with a single shove. Felix opens the back foor of the train and falls out, giving Probe a chance to disarm him. Then Probe notices the passenger car rolling back towards them. In order to keep the passengers from being hurt by the impact against the rest of the train, Probe elects to stand between the cars, which against seems to suggest his powers are somewhere around ‘Hulk’ level, especially considering that Felix is crushed to a bloody pulp by the same impact. The hostages are rescued and a young french woman cuddles up against Probe in appreciation (because, lest you forget, this is about Super-Bond), apparently not turned off by the gore that must be covering his clothes. 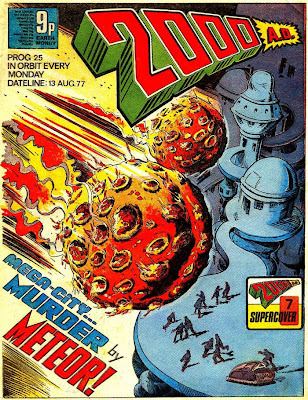 I’m a little impressed – not only is this story in fact set in the world of Judge Dredd’s Mega-City 1 (down to the anti-mutant laws), but it’s actually part one of a two-part Supercover. Not bad, Tharg. 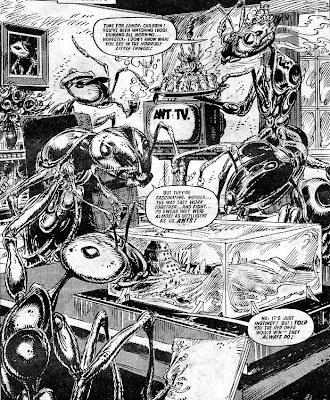 The rest of the nerve center isn’t noteworthy, except for the fact that the reader respons slip (where you tell Tharg what you like about the comic), has 7 entries, but there are only ever six stories in a comic. Am I supposed to put in specific characters? Time for a little satire here in Mega-City 1, as Dredd stumbles across Walter watching ‘You Bet Your Life’, an illegal gameshow where people can either win big money, or die. 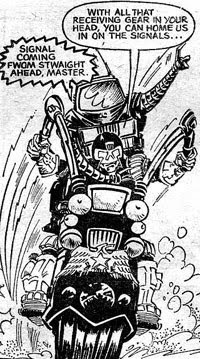 In a decision owing more to Walter’s popularity as a character than logic or common sense, Dredd brings Walter out on the bike along with him. Because the justice department doesn’t have better signal tracking equipment than a vending machine robot. Over at the game show the contestant answers a question incorrectly, which leads to his mother-in-law being shipped off to mutieland. Dredd breaks into the studio and disarms a few guards, while the hosts move on to the next question. 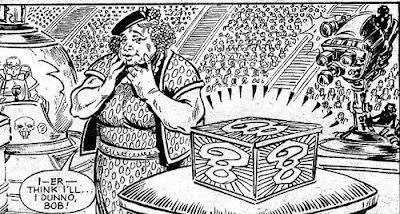 The contestant’s wife is offered ten thousand credits or the contents of a mystery box. Naturally she chooses the box, which winds up containing a giant deadly rad-spider. In this series of panels it’s revealed that the show has a gigantic studio audience. Like sporting event huge. Dredd bursts into the auditorium just as the final question is being asked, and the hosts drop a guillotine on the contestant while running away. 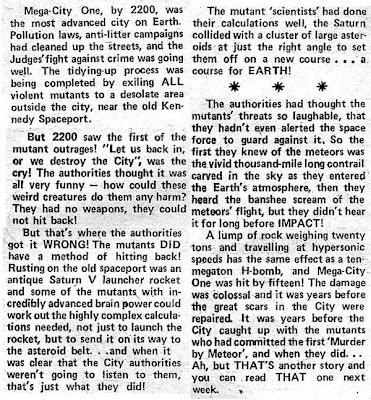 Dredd’s having none of that, though – he shoots the blade in mid-fall, sending the two pieces of metal flying across the room, into the brains of the two hosts. This wraps up the story with a huge number of questions still unanswered. Where was the money for this game show coming from? Who was watching it? Who on earth would be part of the studio audience? Well, it’s a fun idea, anyhow. Best Story: Shako – Yup, we’ve now got the answer of what the movie Jaws would be if it had been told from the shark’s point of view. And featured more double-takes. That answer? It would have been awesome. Worst Story: Harlem Heroes – Do I even have to say it?